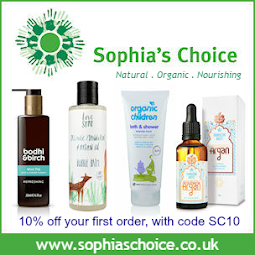 So, the girls are back at school and nursery and the summer holidays are behind us for another year. It’s been a busy week since our return from Cornwall last weekend and it never ceases to amaze me the enormous amount of washing that seems to accumulate over a two week period on holiday despite your best efforts in trying to keep on top of it ! I seem to have had the washing machine on non stop since we got back. Thank goodness we've had such fabulous weather still to dry them all. We took our trusty caravan with us down to Cornwall again this year and spent two happy weeks at The Beachside in Hayle. 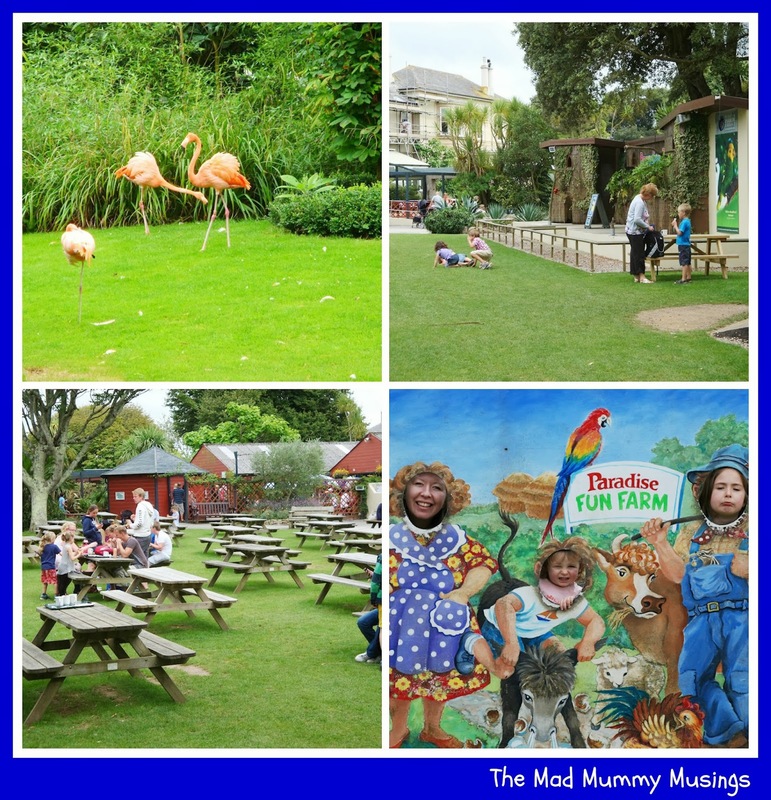 I will be sharing this great holiday park in another post but today I’d like to share one of our days out as a family to the Paradise Park in Hayle itself. 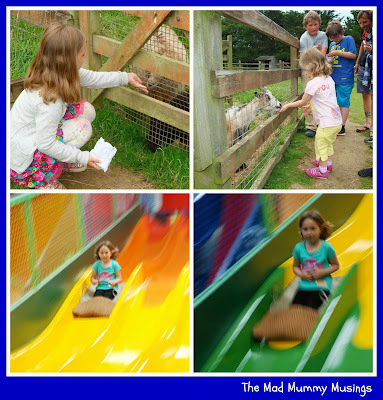 We've visited the park with the girls for the past two years since holidaying in Cornwall and as we were sharing part of our holiday this year with my cousin and her family, we decided to go back once more and show them all the fun to be had. The Park is family run by the Reynolds Family and they chose Glanmor House with its Victorian walled garden when they opened the Paradise Park in 1973. The mild Cornish weather and its sheltered location make it ideal for tropical wildlife and the right conditions for palms, tree ferns and exotic plants to grow. 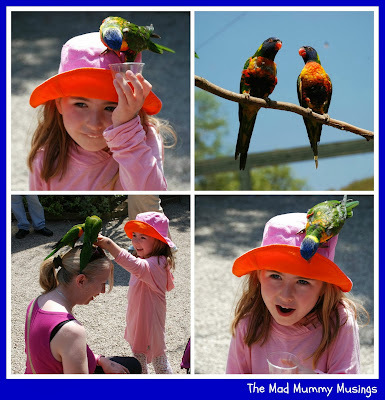 It is also the home of the World Parrot Trust. 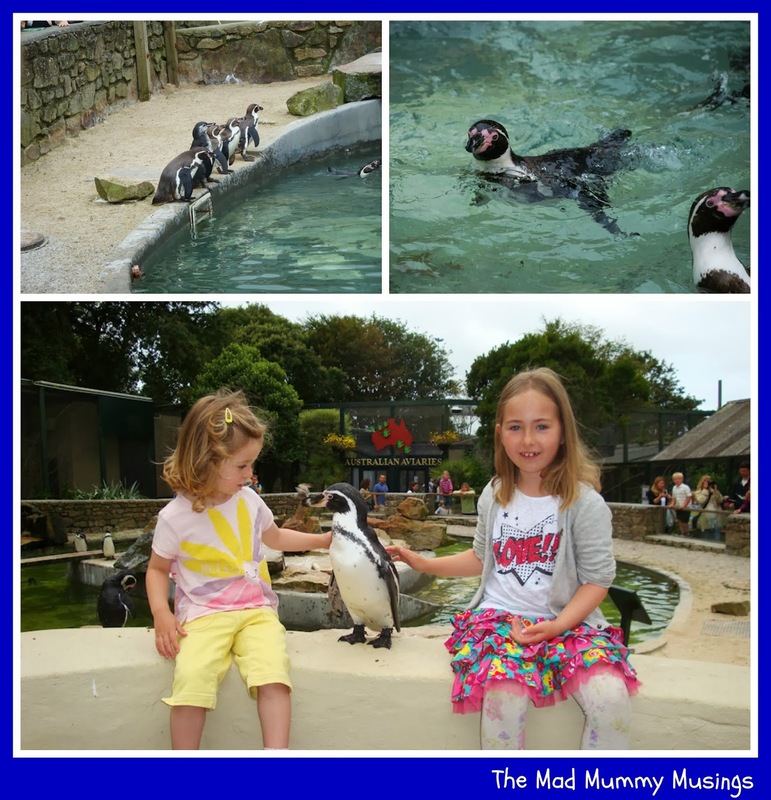 We made sure we arrived in time to see the Otter and Penguin feeding which was interspersed with a ride on the little train that takes you around part of the park. 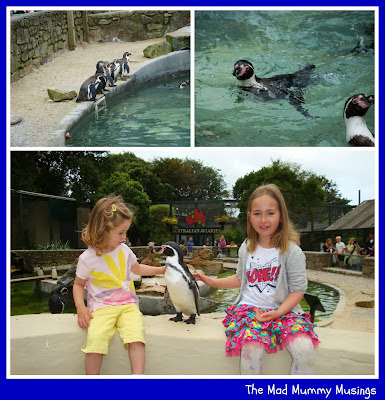 The kids loved seeing the animals being fed and my cousin’s son was one of the lucky ones chosen to feed the penguins. Belle was disappointed not to have been chosen too but this was soon made up for when Tink and her were able to say “hi” to one of the penguins and have their photo taken with her. The park has an array of different birds from flamingos and toucans to Scarlett Ibis’ and the Cornish Chough. We are led to believe that they also have Red Pandas but I have to say that we've never been lucky enough to see them on all three of our visits no matter how hard we try to find them. The children enjoyed their time feeding the goats, sheep and donkeys at the Fun Farm where you can feed them carrots and parsnip. It’s worth noting that you can buy bags of animal feed to take with you when you arrive at the park at 50p a bag. The sheep particularly like these nuts. Once we’d finished feeding the animals we watched the Free Flying Bird Show which showcased a bald eagle, an eagle owl, a Kookaburra among others. 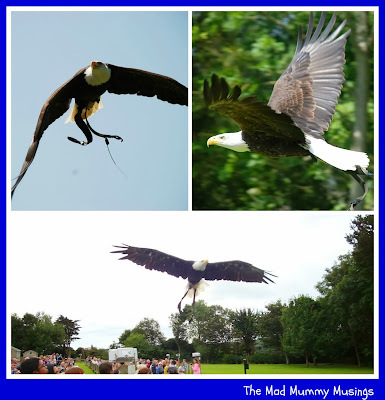 It was fabulous for the children to get so close to these majestic creatures as they swoop over your head. A real must see before lunch. When tummies rumble ready for a well earned lunch, you’ll find plenty of pub table seating outside to picnic at. If you prefer not to take your own food with you, then there’s also a small cafe which sells decent food. We ate there the first time we visited and the food was good. 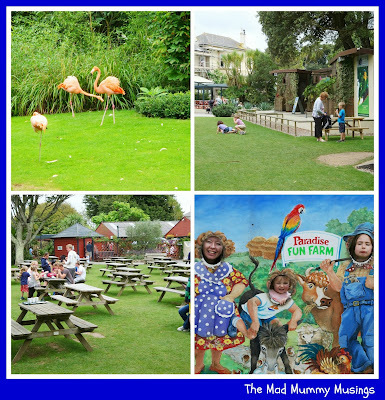 Once our tummies were full again we went and let the children run off some steam in the Jungle Barn which has multi level play zones, an astra slide, double drop slide, ballpool slide, toddler area, snack bar and party rooms. The slides are lots of fun and even little Tink went down by herself this time. What a little trooper ! From here we popped across to feed the little parakeets. Word of warning; get here early. It starts at 2.00pm but the queues form before this time. But it's worth the wait. I've included pictures from out very first trip as hubby had hands free to take piccies that time. Unfortunately we were so enthralled with it all this time we all completely forgot to take any pictures. The nectar costs 50p a pot and the parakeets are really rather friendly chaps. Another word of warning; you may get pooped on ! 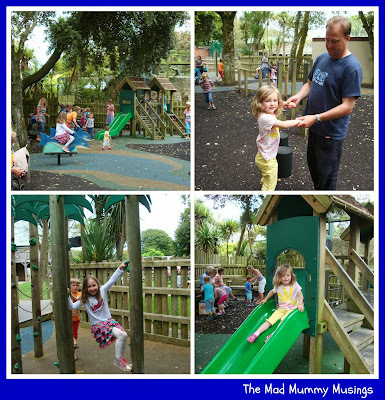 Finally we popped across to Paradise Island to explore the outdoor play area with towers to climb, rocking dolphins to ride, and climbing poles to master. After all this excitement it was about 3.00pm and we’d managed to kill five fun hours with the children. I think now we've been three times we've probably seen everything there is to see here, but I have to say that the girls always want to go back and talk so fondly of their visits here. 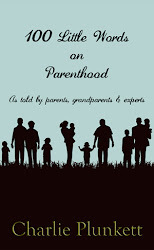 As a family day out it comes highly recommended. It sounds like you had a fantastic time! What a great holiday you've had! The weather was brilliant and I for one couldn't think of a better place to be than Cornwall (I am biased of course as I live here). 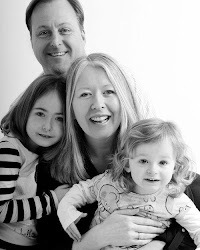 Thanks for linking up and sharing your lovely photos with Country Kids.